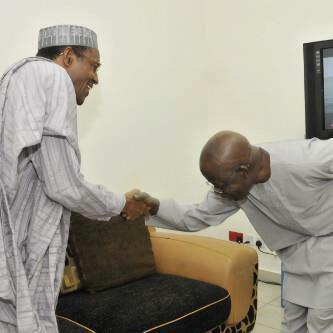 Former Governor of Lagos State bowing to General Buhari. This image has drawn many negative comments from some group of Nigerians. The reasons are obvious. First is the issue ot tribe and the other is the nature of Nigeria’s (crazy) politics. Here is former president Clinton also bowing to Obama. Those who think that what Tinubu did was in order have used this image to press home their points.